So here is my dilemma. I transferred the beer into the secondary carboy with 1 ounce of Amarillo hop pellets sitting on the bottom. 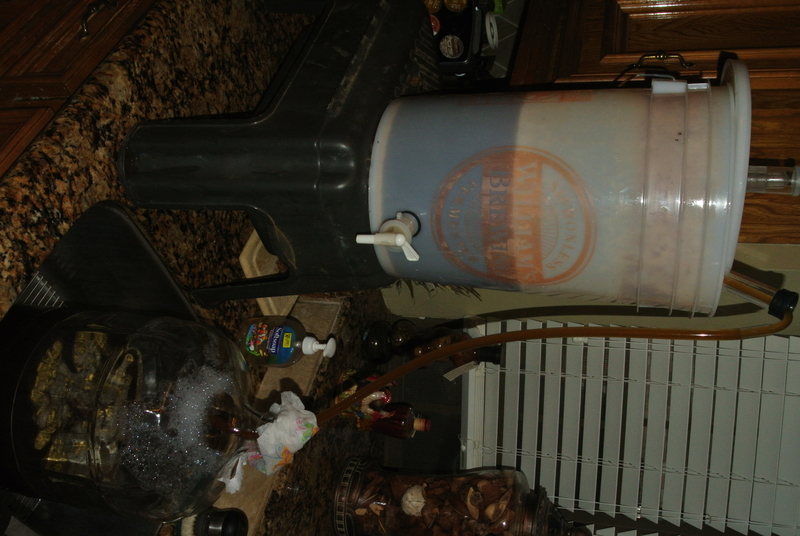 Once the beer was transferred, I gave the carboy a nice swirl to get the pellets to settle. I then carried it out to my temperature controlled chest freezer. I now need to decide on a temperature scheme/schedule during the dry hopping phase. From my exploration of the web I find too many choices, schemes, schedules and opinions! Two days at room temperature and then crash to 35 degrees for up to two weeks. Five to seven days at low room temperatures then rack off and package. Five to seven days at room temperature and then crash to 35 degrees for 2 days prior to packaging. And too many variations to list!!! My choice – the logic I like is; hold the beer at a temperature that will allow the aromatic oils in the Amarillo hops to best express their amazing aroma. So, five days at 65-67 degrees then crash to 35 degrees for a couple of days to aid in clarifying the beer before I bottle. I am convinced that the beer will be very good! 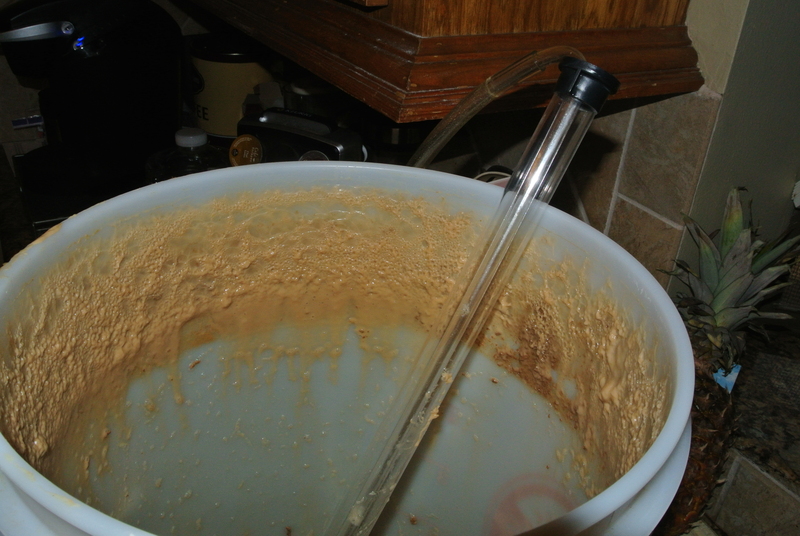 While racking the beer into the secondary I noted that the fermentation was vigorous – the Krausen was thick and reached the lid of the primary. I guess that I was lucky that it didn’t lift the lid or fill the airlock. Note to self: consider a blow-off tube next time for the early yeast activity! 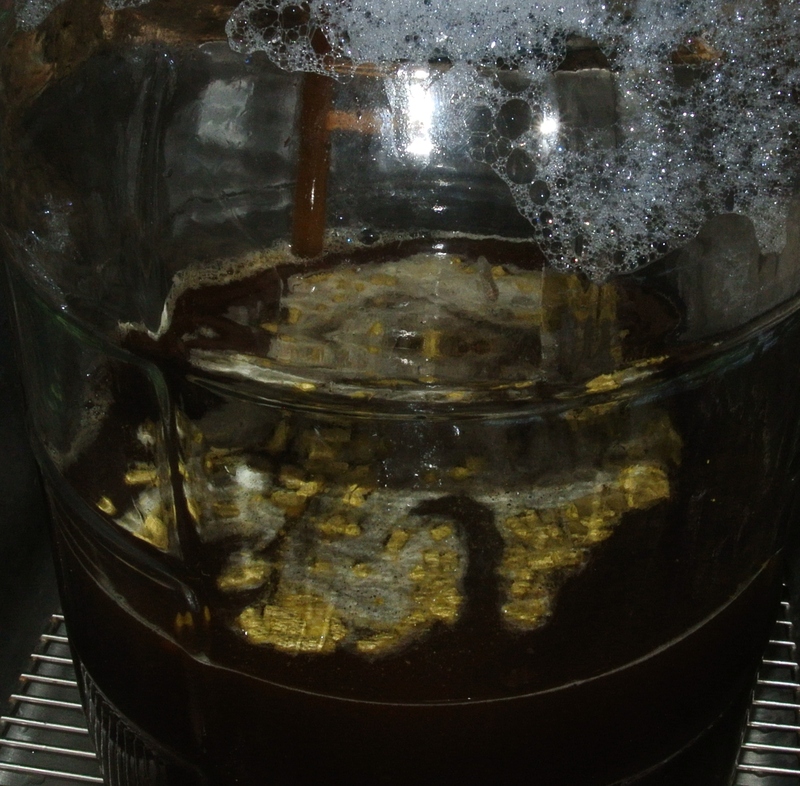 Transfer from primary fermenter to the secondary and hop pellets floating on top. Hop pellets floating on top of the beer – kinda look like the rabbit pellets we fed them! Evidence of the Krausen on the sides… gotta be a good beer. I bet some of you are thinking, is he going to drink that? Yes I am! I just had to share a quick update on the Inspiration Beer at the end of it’s first week in the primary fermenter. The original gravity, the OG, was 1.066. A week later it had dropped to 1.016! I am pleased with the progress. Tomorrow I will rack it over to the secondary and add 1 ounce of the Amarillo hops. The first taste, that’s right, I couldn’t dump the graduated cylinder full of the beginning’s of a nice beer and let it go to waste, was very nice and not as hoppy as I had expected. I shared a taste with my son’s girlfriend and she found it drinkable. Patience Bishop, patience! I am wondering if an ounce will be enough??????? Maybe I shouldn’t get too frisky and just stay with the original recipe! Thanks again to the great folks at Lengthwise Brewing in Bakersfield CA! I hinted a couple of weeks ago about being inspired to brew something a bit unique. Well I made it happen today….the recipe was developed about a week ago from some inspiration found in a conversation with the bar keep at Lengthwise Brewing Pub in the Marketplace – Bakersfield California. I was attempting to order a beer and the big chalkboard had these tree words stacked above each other in the lower left corner of the board. So, I ordered one…..it sounded like an interesting beer. The barkeeper smiled while telling me that those three were part of the tap line-up for the brewery. I had been fully aware of their Centennial and Double Centennial IPA’s, The Kern River Crude Porter, the Blonde as well as a host of guest beers on tap. It just didn’t dawn on me that these were three distinct beers. The ensuing conversation made me feel a little better. Apparently I am not the only ” cerevisaphile – A devout lover of beers.”, that has made the same, I won’t call it a mistake, but rather the natural combining of those yummy sounding beer components. So I was struck by inspiration and went on my mission to build this beer. The recipe; Partial mash – the easy way. 2 oz. Black roasted barley – crushed – the crushed grains should add body and the Red portion of the inspiration. Grain placed in brew pot and removed when temperature reached 170 deg F.
OG is 1.066 – Fermenting at 64-68 deg F Aerated for 3 minutes prior to pitching Wyeast 1056 Ale yeast. At two weeks I will check and transfer to the secondary then dry hop with the remaining Amarillo hops. This should be a hoppy beer, not real bitter, but should have a good floral and citrus aroma. Now the big challenge is to be patient! 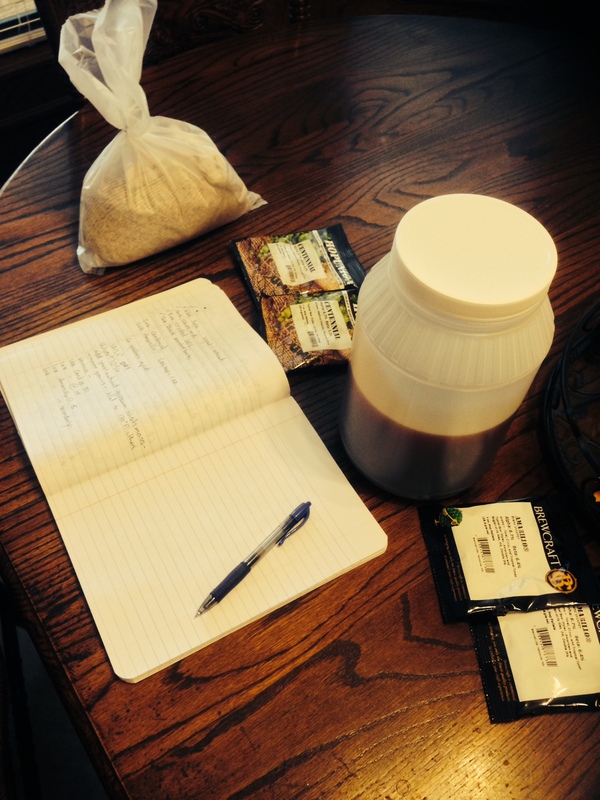 Brewing notebook, malt extract, grains and hops. Ready to brew.